Gento – Tools Magento Theme suitable for any kind of e-commerce store and is fully focused on showcasing your offers and products. The theme can be easily customized thanks to the variety of theme options. This enables you to change the fonts, colors, layout, and more. Set up amazing banners and sliders, add Featured Products block to promote your latest additions, or highlight multiple items. Moreover, you can add the label, such as New or Sale, to any product to highlight the product even more and encourage customer to purchase. 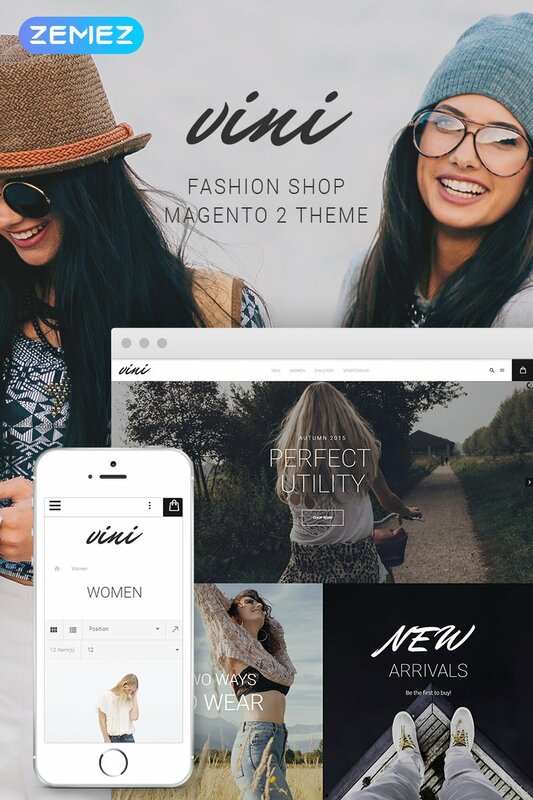 Vini – Fashion shop Magento Theme is a great solution for fashion stores. The buyer can sort out the products with the help of multiple filters placed at the left sidebar. Clothing photos are large and you can post lots of them to show your items from all sides. Besides, products are supplied with stickers, star ratings, prices, color palettes and call-to-action buttons . You can find this template among the chart of The Best Magento Themes 2016. StorLlic-Computer Hardware Magento Theme has minimal and clean design which suits best for Computer Hardware or Electronics Store, the theme is compatible with Magento 2 and fully responsive, so that it looks nicely on any device from desktop to mobile. The code integrated into the theme meets all SEO requirements, as well. Launch your store within several days and start getting your orders. The theme offers you all essential modules, tools and widgets to create and customize any page element, such as banners, sliders, menu or products. GrandCosmetics – Cosmetics Store Magento Theme is the most powerful and fresh Magento 2 theme suitable for any kind of e-commerce store selling beauty supplies, healthcare products, cosmetics or make up. GrandCosmetics is full-fledged theme equipped with all the necessary extensions to build a self-promo website with a newsletter subscription and social networks integration. With MegaMenu module it is no longer a hassle to create a dropdown menu of any structure. 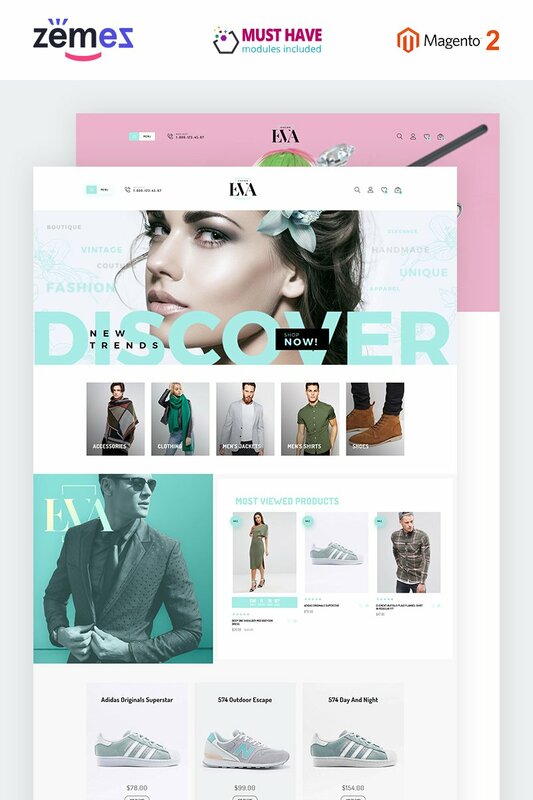 EVA – AMP Fashion Store Magento Theme is highly responsive and multipurpose Magento 2 theme which is ideal for creating web-sites dedicated to fashion and beauty. The theme features a great selection of tools to manage your online store content effectively and effortlessly. Spice up your online store with multiple slides and banners and make your store pages look colorful and informative at the same time. Put your products’ highlights right on the homepage with an option to directly add the item to the cart. 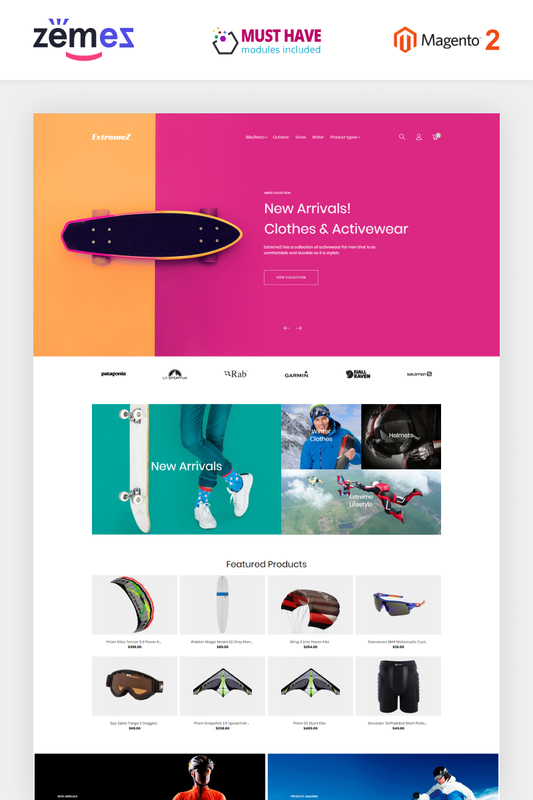 ExtremeZ – Extreme Sports Magento Theme is creative and unique theme which can be ideal and most practical solution for creating sport closing, apparel or any extreme sports supplies e-commerce store. The theme unusual design could be a great advantage when it comes to your store brand recognition. The theme equipped with tones of customization and management tools in order to create online store and configure filters, main menu, newsletter and product carousels. 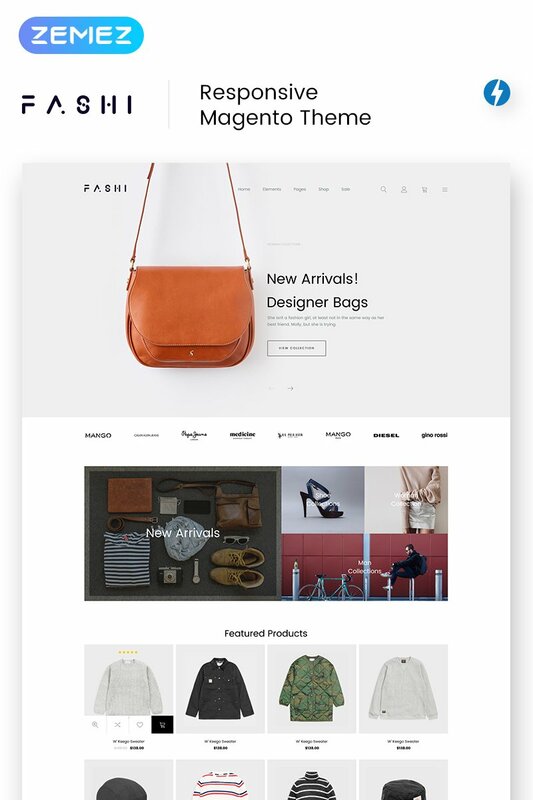 Fashi – Fashion Boutique Magento Theme s a nice and light-weight theme designed specially for fashion online stores and boutiques. The theme includes all extensions and modules you need to build and manage your web-site effortlessly whether you are a novice or an expert in e-commerce business. Besides, Fashi is incredibly customizable theme which makes it versatile and unique at the same time. With this theme you get unlimited control over content and limitless design elements variations. Flash – Multi-Purpose & High-Performance Magento Theme can be one-stop solution for you. Flash is the ideal choice to launch a completely responsive online store, due its multipurpose nature the theme can be easily adapted to any e-commerce niche, whether you are selling jeans or home appliances. Flash features 3 Home Pages, 4 Header and 4 Footer layouts that can be enhanced with any type of custom content, such as clickable banners, edge-to-edge sliders, featured products blocks with tabs structure, list of blog posts or store brands with no need of extra extensions. With Flash theme you will get your store mobile content to load in 2-3 seconds. RedDragon – Martial Arts Magento Theme is the perfect one to start you own eCommerce business and launch an online store to sell Boxing and MMA gear. This theme can be transformed into boxing, karate, judo, yoga, fitness, gym supplies, or sports clothing online store. Turn your store to a well-recognizable and self-promotional eCommerce website. Enrich your website with bespoke and individual sliders and banners in a matter of seconds. GoofyStore – AMP Men’s Fashion Magento Theme is a great choice to build a fully functional Men’s Fashion online store. The theme comes with a bunch of useful extensions which will help you to customize your website to meet your needs and demands taking into account the recent design trends. The clear and minimalist layout will definitely make a significant impact on the site visitors. The theme is fully responsive and looks great on the mobile and desktop devices. Fashion Slash – AMP Boutique Magento Theme is definitely a top choice. It uses elegant typography, spacing and a minimalist style which makes the theme unique. The theme is optimized for speed and SEO requirements and also comes ready for child themes. Fashion Slash theme features a full-width slider and multiple banners with gorgeous hoover effects which makes it simple to showcase your best store deals and products in the most stylish and effective way to grab your store visitor’s attention and increase your sales. All of us read magazines from time to time. Sometimes they can really help to while away the time at the hairdressers’, for instance. Or to get to know the latest fashion trends and distract from the obtrusive thoughts. This cheerful, attractive website will help your customers choose the magazine according to their interest without losing their precious time going out to the nearest newsstand. Website’s logo is easy to memorize. New products are offered in four columns and supplied with large green calltoaction buttons. Now it’s your turn to make the next move, buy this template and start selling your magazines to larger auditory online. No matter what the company working field is, it should have a strong brand identity to be a success. Business cards play an important role in brand building. With a professional theme, designed specifically for business card stores, you’ll reach your targeted audience without effort. Its impressive slider and banners together with sidebar navigation help the buyers find the product they wish without losing a minute. New products are placed in three columns. Footer links are well structured either. They are arranged in four columns which creates the feel of order and harmony on the page. Today’s medicine can work wonders, but they would be impossible without ultramodern equipment. If you sell the lifesaving devices, you simply should demostrate them on the internet to supply more hospitals all over the world with decent appliances. Our template done in white and green colors will ideally fit your company concept. It looks clean, accurate, and very professional. The designer perfectly conveyed the feel of quality and trustworthiness through the layout. A slider displays the most advanced medical products. The main menu, banners, and footer links help the buyers find the item they need quickly.